Today in Masonic History Howard Landis Bevis is born in 1885. Howard Landis Bevis was an American attorney and educator. Bevis was born on November 19th, 1885 in Bevis, Ohio. He graduated from the University of Cincinnati in 1908 with a Bachelors Degree. He went on to graduate from University of Cincinnati College of Law in 1910. During World I Bevis never enlisted, although he did serve as a civilian with the United States Army. First he served in the Ordinance Department. He later was the chief of the legal section of the finance division of the Army Air Corps. After World War I, Bevis returned to school and this time received a law degree from Harvard Law School in 1920. After graduating from Harvard, Bevis returned to Cincinnati and opened a law practice. He also served on the faculty of the University of Cincinnati College of Law. In 1933, Bevis was appointed to the Ohio Supreme Court to fill a vacancy. He would never run officially to fill the seat for a full term. After serving on the Ohio Supreme Court Bevis would take a position on the faculty at Harvard in business in public administration. 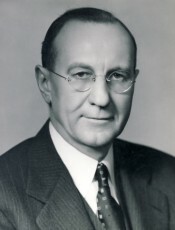 In 1940, Bevis was appointed the President of Ohio State University. As President he refused to cap the number of veterans who were admitted to the school on the G.I. Bill. At the time it was the common practice to restrict veteran enrollment. His service during World War I was a strong factor in his decision to allow admissions. Despite objections from the faculty, under Bevis the enrollment of Ohio State University grew from 12,000 to 26,000 in just one year. In 1985, Bevis, posthumously, was elected to the American Academy of Arts and Sciences. Bevis passed away on April 24th, 1968. Bevis was a member of McMakin Lodge No. 120 in Mt. Healthy, Ohio.